THE EUROPEAN COUNCIL has agreed to delay Brexit until 22 May if British MPs back Theresa May’s deal next week. The decision was announced last night but has some stipulations. If the UK parliament doesn’t vote in favour of the Withdrawal Agreement – a deal it has already rejected twice – the new deadline would be 12 April and Britain will be expected to indicate a way forward before that date. The May deadline was unanimously agreed upon by the other 27 leaders of the European Union’s member states following discussions in Brussels yesterday. Britain was due to officially leave the EU on 29 March, just a week from now, and May had requested an extension until 30 June. Speaking at a press conference last night, President of the European Council Donald Tusk said Britain now has four options: a deal, no deal, a long delay or revoking Article 50. “The 12th of April is a key date in terms of the UK deciding whether to hold European Parliament elections. If it has not decided to do so by then, the option of long extension will automatically become impossible,” Tusk said. At the same press conference, President of the European Commission Jean-Claude Juncker said the EU is ready for all outcomes, including a no-deal Brexit. May insisted at a press conference after the announcement that Brexit will still happen. 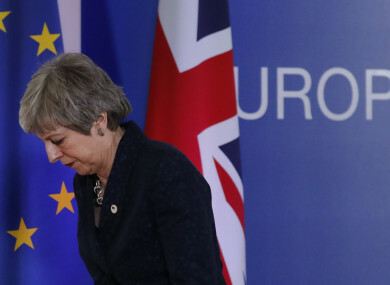 About 2.5 million people have to date signed an online petition calling for the British government to cancel Brexit by revoking Article 50. The petition, which was launched on Wednesday, says a “second Brexit referendum may not happen – so vote now”. May has consistently said she will not revoke Article 50. Speaking on RTÉ Radio 1′s Morning Ireland, Minister of State for European Affairs Helen McEntee said the extension avoids “a cliffedge” next week, adding that “nobody wants a no-deal scenario”. She said the political situation in the UK is “quite chaotic and likely to change any given day” but that the deal may still be backed by MPs. McEntee reiterated Europe’s stance that negotiations on the Withdrawal Agreement are “not for reopening”. She said she doesn’t want to preempt what will happen in the House of Commons next week but noted that if MPs don’t back the deal, the UK needs to present other options before 12 April. “It is on that date that the UK has to signal whether or not they’re running in the European elections,” she noted, adding that Britain must then “set out very clearly what it is that they want to do and how they want to move forward”. McEntee said the Irish government is committed to avoiding a hard border between the Republic and Northern Ireland in the event of a no-deal Brexit and will work with the UK and the European Commission to make sure this situation doesn’t come to pass. Negotiations are ongoing behind the scenes in a bid to get MPs to back May’s deal. This uphill battle may have been made even steeper after May hit out at MPs for not backing her to date in a televised speech on Wednesday night. “MPs have been unable to agree on a way to implement the UK’s withdrawal. As a result, we will not leave on time with a deal on 29 March. This delay is a matter of great personal regret for me,” May said. Her speech was sharply criticised by many MPs, from across the political divide, who viewed it as an attempt to shift blame for the ongoing crisis from herself to others. Asked at last night’s press conference if she would apologise for her comments, May said she understands that MPs are frustrated, saying so is she. Earlier this week doubt was cast on over whether or not the House of Commons would actually vote on her Brexit deal for a third time. On Monday, John Bercow, Speaker of the House of Commons, said the government cannot have another meaningful vote on the deal if changes are not made to it. Email “May faces uphill battle to get support for Brexit deal, as Ireland insists there won't be a hard border ”. Feedback on “May faces uphill battle to get support for Brexit deal, as Ireland insists there won't be a hard border ”.